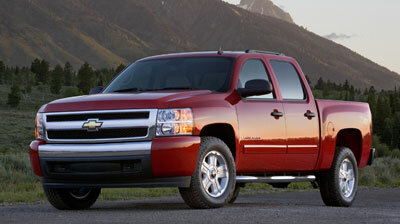 The Chevy Silverado earned the 2007 North American Truck of the Year title based on votes from a jury of nearly 50 independent automotive journalists across the U.S. and Canada. Considered the most prestigious of their type, the awards are designed to recognize the most outstanding vehicles of the year based on factors including innovation, design, safety, handling, driver satisfaction and value. The all-new 2007 Chevy Silverado incorporates new exterior and interior designs, new powertrain, chassis and safety systems. “The new Silverado’s styling, both inside and out, is a quantum leap forward,” said juror Tom Lankard, who writes truck reviews for NewCarTestDrive.com. “Chevy has the best offering in an intensely competitive market, great chassis, great powertrains, great variety, great drivability, great value.” said Tony Swan, an editor at Car and Driver and former editor of New Car Test Drive. “Improvements in the interior as well as the steering, braking and handling, give this workhorse the comfort and dynamics of a finely built automobile without sacrificing its ability to get the job done,” said Matt DeLorenzo, Road and Track. “Hard to believe: over 20 mpg highway operation with a full-size pickup truck . . . and a 315-horse V8, but the Silverado did it,” said Paul Weissler from Motor, an industry publication. GM says the fourth generation of the legendary small-block V8 engine delivers segment-leading horsepower and fuel economy. Silverado offers the widest range of truck configurations with three cab sizes, three bed lengths, five suspensions, and two distinct interiors. Safety was paramount in the design of the new Silverado, resulting in a 5-Star NHTSA crash test rating. The jurors represent media outlets such as the Car and Driver magazine, Road & Track magazine, AutoWeek, USA Today, The Chicago Tribune, the Boston Globe, The (Cleveland) Plain Dealer, the San Jose Mercury News, the Toronto Star, NewCarTestDrive. com, Edmunds.com, Consumer Guide, MotorWeek, Autoline Detroit, Automotive News, Popular Mechanics and Fortune. The fact that the jurors work for different media outlets makes it impossible for any one person to influence the outcome. “The jurors who voted for this award represent the best automotive journalists from print, radio, television, and the internet, both in Canada and the United States,” said New Car Test Drive editor Mitch McCullough. McCullough was chosen to announce the winners at last year’s North American International Auto Show in Detroit. The North American Truck of the Year award is designed to recognize the most outstanding vehicles of the year based on many factors, including innovation, design, safety, handling, driver satisfaction and value. To be eligible vehicles must be “all new” or “substantially changed” from the previous model.